Team Anna to visit Uttar Pradesh (UP) from from February 2 till Feb 25 during Assembly election 2012. 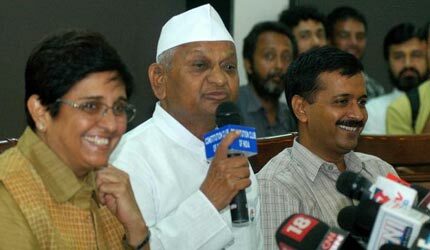 Team Anna said it will instead highlight the issue of corruption and the response of various parties to it while touring the poll-bound states in January- February 2012. “The movement would not ask people to vote in favour of or against any particular party. People would be encouraged to ask all parties whether they would bring a strong Lokayukta bill during the tour,” said a release sent to all media houses. India Against Corruption (IAC) activists will tour the poll-bound states, starting with Uttarakhand Jan 21-23, during which they will tell people about the response of various parties to the anti-corruption movement and their stand on the Lokpal bill. The IAC would visit Punjab for two days Jan 24-25 before returning to Uttarakhand Jan 27-28. The month of February has been primarily dedicated to elections in Uttar Pradesh, which Team Anna would visit from Feb 2 till Feb 25.